This project has been in the making for many years. It started off as a feeling. When I first got to Cambodia, I felt I had arrived in a place were anything was possible. Cambodia was booming with opportunity, and it was deeply forgiving of mistakes. It was the ideal place to set up as 24-year-old photographer with very little experience in the freelance market, and I started off by looking for jobs to keep me afloat. It was a slow start, as all freelance photographers can probably relate to; small jobs here and there, the odd big contract and a lot of time for blog posts, internet updates and importantly personal projects. I started documenting the lake area in Boeung Kak. 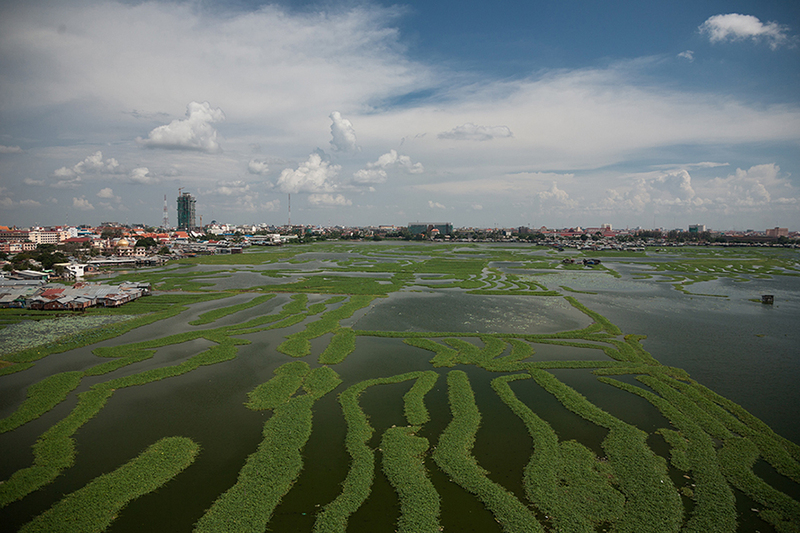 A massive body of water in the centre of Phnom Penh, the surface was largely covered in morning glory plantations, and all around lived small communities made up of families from diverse backgrounds. With its multiple facets, Boeung Kak was the ideal place to document life. Through working there, I learned that the area was slated for redevelopment. Authorities had the outlandish plan of turning the whole lake into a commercial and residential complex and planned to evict more then 4,000 families from the area. The expanse of the lake was filled in over more than four years. Through the photographers and human rights workers I met while documenting these communities I learned that Boeung Kak was not the only area in Phnom Penh were this was happening. My work began to expand, I started looking at other communities: Borei Reak Reay, G78, Borei Keila, the ‘Green buildings’, Tompong Lake, the communities living along the railway lines, the area behind the airport. All of them were areas in various stage of re-development and the people were getting moved out and sent to different places on the outskirts of the capital. It was heartbreaking to see how people had to pack up their lives, leave their homes with little to no compensation and move to relocation sites, often fields in the middle of nowhere. Some communities fought back in what often resulted in violent clashes with authorities. Others resigned to their fate, picked up their belongings and left. The majority had legal rights to the land they had been living on. I am still not sure what prompts people to move on seemingly with such courage. Was it religion, acceptance to change, the belief in Karma, or the fear of renewed conflict after the Khmer Rouge, and the following civil war? Maybe it was all those things and more. Often the hardest thing to see was the people fighting back, struggling for their rights, going against a force they could not resist. Their fights would lead them to prison or end with their homes destroyed. Little would change in their plight. When watching communities resettle on the outskirts of town you would hear the endless complaints of people I had gotten to know quite well. They would come to me, and to others that had witnessed or documented their situation with the same words: ‘We are far from work’, ‘We are far from healthcare’, ‘We have no access to water or proper sanitation’. As a photographer, what could I do? I made phone calls, I worked with organisations who had leverage, I listened, I posted images and stories on my blog and website, I contacted publications to try to share their stories. I documented their lives, and the truth is, many of the communities I photographed are still there, and still facing the same difficulties. After a discussion with a very close friend who had noticed how the middle class was changing, I found that this was a logical step to continue my work. This rising middle class was composed of the very people who would be moving onto the reclaimed land once new infrastructure and new developments were set up. There was a massive boom in the consumer culture, traffic was increasing at an exponential rate, people were buying up cars, home appliances, phones and other consumer goods. I found it quite funny to see how cars started clogging the roads, but people were in no hurry to drive through traffic. They were happy to show off their new vehicles. This has now changed. Sitting in a car stuck in traffic is no longer a way to brag, but an annoyance. As the number of vehicles clogging the roads increased, the formerly relaxed drivers became pushy and impatient. And so I started documented the rising middle class: From car shows and home improvement expos, to the places where people would eat, play, or shop. As this was happening, new buildings where going up on the land that had been cleared for development. The landscape was changing fast, and so my work took this logical step of looking at the change in infrastructure. When the national elections approached in 2013, there was vibrancy in the air. People who before were scared of talking about politics suddenly became very vocal. The whole period from June 2013 until early 2014 saw many protests, people were going to the streets to be heard. When I arrived in 2008, this would have never happened. There was equally a massive rise in pro-active youth in politics but also youth who were pushing the boundaries of socio-cultural change. So my work evolved to see what the youth was doing, and how they were shaping the country. All the topics I focused on had one thing in common: I was looking at how a country that had been set back by dark years of war was trying to catch up with the modern world. What would take decades to happen in most parts of the world was noticeable in Cambodia on a daily basis. Even as I sit here and write this post I can hear construction sites rattle away, just from my window six new high-rises clad in green safety nets are springing up. To understand Cambodia, and I don’t claim to be an expert, rather a keen observer, we also need to look at the culture and traditions. This is a very big topic. Even foreigners who have spent decades here and speak the language fluently still grapple with the many facets of culture. Rather than diving in beyond my depth and looking at too many different angles, I chose the topic of family to help explain what makes Cambodia Cambodia, and what makes Cambodians Cambodian. Everything shifts around family, alliances, decisions, and the future. I have acquaintances that have impoverished themselves beyond reasonable limits to provide for their children or to help a sick relative. This happens around the world, but in few places is it as prevalent as here. At a moment's notice, people will walk off a job to help a family member. It felt only logical to include this in my book, because we need to know the background of something to understand where it is going. I am lucky, because in early 2013 I started working in a collective. Founded by Thomas Cristofoletti and myself, we work with writers and other photographers on long-term documentary projects. After two years of collaboration, RUOM has grown to a group of seven core members, one of which is Denise Hruby. Equally a resident of Cambodia for several years, Denise first worked with the Phnom Penh Post and later with the Cambodia Daily. She is now a freelance writer who takes on board her own projects as well as various commissioned stories. With a strong connection to Cambodia and a diverse experience documenting the country, she eagerly volunteered to write the text for the book to explain the many stories that are told through the images.